Affiliates of the Islamic State terror organization are already residing in the United States, though exact numbers are unclear due to the Obama administration’s efforts to downplay and hide information about this threat from the American public, the former director of the U.S. Defense Intelligence Agency told the Washington Free Beacon in a wide-ranging interview. Gen. Michael Flynn, an adviser to Republican presidential candidate Donald Trump who served as a top intelligence official under the Obama administration, warned that "they are here" when asked by the Free Beacon to characterize the threat posed to Americans by undercover ISIS adherents. "They are here," Flynn said, disclosing that he is aware of roughly 1,000 instances in which ISIS members have been caught plotting in the United States. "The director of the FBI has said it," Flynn explained. "There are dozens and dozens and dozens, and I think the number I’ve heard is 1,000, but I don’t know the exact numbers. But I do know there are a lot of cases against members inspired or directed by the Islamic State in this country." Information about these individuals is not well known to the American public due to efforts by the administration to downplay and suppress news relating to these terror plots. 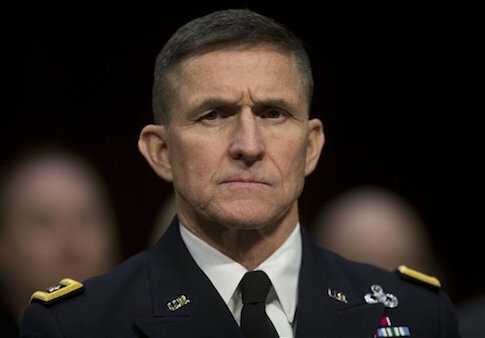 "There should be more publicity about what we’ve discovered," said Flynn, co-author of the book Field of Flight: How We Can Win The Global War Against Radical Islam and Its Allies. "We ought to expose it, expose its [ISIS’s] weaknesses, expose its dangers to the American public. We’re a tough crowd. The American public is tough. We can take the truth." Scores of foreign-born individuals residing in the United States have been arrested on various terror charges in the past few months, multiple Free Beacon investigations have discovered. Flynn has taken issue with the Obama administration’s refusal to describe these terrorists as adherents to a radical brand of Islam. The goal of ISIS and other radical terrorists is to slowly infiltrate the West, according to Flynn, who said this is already happening across the United States. "This is an enemy that actually sees our way of life as something that is not acceptable," he said. "They’re infiltrating, and their campaign plan is to basically dominate the world essentially through letting Islam bloom." Leaders in the United States refuse to acknowledge this reality and are actively downplaying the threat, Flynn said. "Is this something that is acceptable to our current leadership? Because this is something the enemy says it’s doing. They have declared war on us." "They are doing a variety of things. Some are tactical attacks that you’ve seen. Some is just infiltrating into sort of what I call the bloodstream of main street America. That’s just the way they’re going to do it," he added. America’s difficulties in facing down ISIS are the result of the Obama administration’s failure to clearly define our enemy, Flynn said. "Warfare 101 is know your enemy, know yourself, you’ll win 1,000 battles," he said. "This president, who is also wearing the hat of commander-in-chief, has shown really a level of incompetence when it comes to clearly understanding and clearly defining the enemy we are facing. This is a political problem. We face political incompetence at this point." The next U.S. leader, Flynn said, must take steps to clearly define the enemy and the threat it poses to Western values.